The rose garden is situated in the beautifully terraced south-facing side of Westport House. The sunken rose gardens gradually taper in a terraced fashion down to the basement level of Westport House. This sunken-terrace effect provides a peaceful and sheltered space in which to enjoy the 180 vibrant red rose plants that we have planted. We chose ‘Rosa Alec’s Red’, a wonderfully fragrant variety that boasts striking large crimson roses on long elegant stems, and that blooms continuously through the flowering season. This was the first restoration project of the gardens, and works began in late February 2018. The four existing beds were in an overgrown state, and their soil had been leached of any nutritional content. They were in need of some serious TLC. However, before we could get stuck in, it was important to research the historic setting of this beautiful corner of the estate, and to ensure that a redesign would be sympathetic to the design of the house and estate. The geometry of Westport House is all in threes – see how many patterns of three can you spot that when you’re visiting next! The principal is rooted in the aesthetically pleasing symmetry that trios create. The Latin phrase ‘omne trium perfectum’ (everything that comes in threes is perfect) sums it up nicely. The existing four beds were arranged in twos, on either side of a yew-lined central stepped pathway. I wanted the proportions to chime once more with the house, so three rose beds on either side. This meant that two additional rose beds needed to be created at the bottom level of the terraces to complete the pattern of threes. The first job was to dig up the old rose beds and realign them to the correct, equal proportions and depth. The new two beds for the bottom level where the hardest, as 20 centimetres below the surface we hit bedrock. We had to break it out and remove the rock to a depth of one metre. It was quite a job. Additional drainage was then introduced to all the beds, and a heavy layer of mature horse manure, which roses love, was added to each. This was topped off with a final layer of deep, rich, brown-earth top soil. All the roses were then planted. The 180 rose plants were divided equally, 30 for each of the six beds (yes, everything is divisible by the magic number three). They were then lovingly tended to over the first few weeks; after all, they were our newborn babies! The pathways around the terraces were next on the agenda. One thing that jumped out at me during the winter months at Westport House was the pervasiveness of grey. It was everywhere. Grey sky, grey house, grey garden walls and grey gravel on all the pathways. It wasn’t very uplifting. There wasn’t much I could do about the grey skies, and the historic house wasn’t about to be painted (imagine! ), but the gravel – now that’s a different story. I could definitely do something there. I decided to go for a change, and brought in a light, sandstone-coloured gravel, the kind that was typically used in stately homes in the 18th and 19th century. It has worked wonders. It brightens up the space no end, and serves to further highlight the house and its magnificent presence. Oh, there was just one more project completed the rose-garden restoration: the yew trees that line the pathway had become overgrown. These were selectively pruned back to allow people walk through and light back into the space. Redesigned, reinvigorated and vibrant, the rose garden is now the inviting fragrant haven it was always meant to be. Do come and enjoy it, and let us know what you think! Oisin is a qualified landscape architect with a masters degree in construction project management. 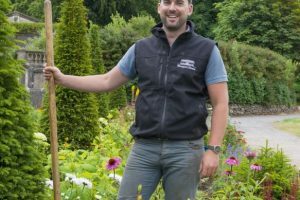 He placed in Bloom twice and starred in RTE’s Super Garden. For fun, he enjoys surfing, running, biking and all things outdoorsey. 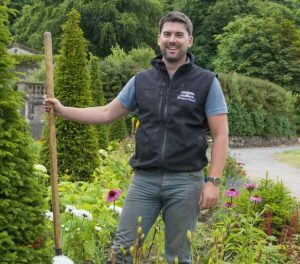 Oisin worked his way through college – for five summers – in Westport House.